Kolkata (which for me will always be "Calcutta") is a pleasant surprise. Howrah Station is orderly and (by Indian standards) clean. There are no squatters in the entrance hall; just passengers scanning the electronic boards displaying arrival and departure schedules. The pre-paid tax stand offers prompt and efficient service, and the Howrah Bridge, once a nightmare of milling people and traffic, is a breeze to cross. We whizz over in less than three minutes, with nary a horn blast from the taxi-driver! The sky which I remembered as being the colour of dredged mud, is cobalt-blue and it isn't until we hit the chaos of Bow Bazaar that Ihave to wind up the taxi windows against billowing clouds of diesel fumes. Even the battered old "biscoot tin" trams have been gussied up with orange paint and eye-catching ads. The air-conditioned underground transit system, although perhaps not quite up to its billing as "the best in the world", is nonetheless remarkably clean (no vendors or beggards) efficient - and cheap! The station platforms also display the work of local artists instead of advertising billboards. 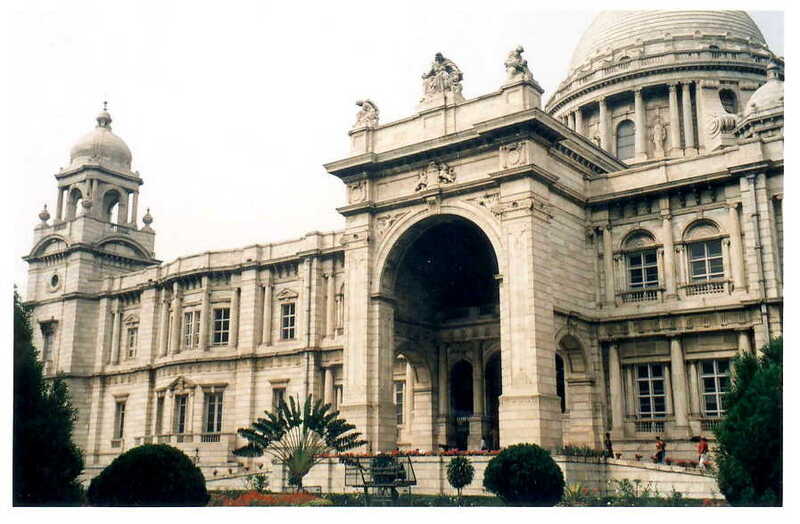 Calcutta, although rich in Bengali culture and tradition, still has Raj overtones: Writers Building, Dalhousie Square, Fairlie Place, the Ochterlony Monument, the Victoria Memorial, St. John's Church, All Saints' Anglican Cathedral and the Park Street cemetery...all of them are reminiscent of three centures of colonial rule. The names of many of the streets and monuments have changed but that is neither here nor there. It takes more than a cartographer's pen to wipe out a city's history. It is also "my" Calcutta. Filled with recollections of excursions into the New Market (not much changed except for a noticeable lack of Anglo-Indians thronging its maze like corridors), browsing along Chowringhee and dropping into movie theatres like the Metro, Lighthouse or New Empire. No visit to Calcutta would be complete without eating at Nizam's (which still serves the best kati-kebabs in the universe), Flurys, Magnolias and Jimmy's Kitchen. Nahum's in the New Market still makes confectionery but it isn't the season to sample their Christmas cakes, or to find out whether they make Birthday cakes as they once did for my sister and myself, in the shape of grand pianos or Victorian Ladies. The New Market flaky mutton-filled patties are a thing of the past, but not so the Calcutta spiced sausages from the Entally market. These come as a unexpected treat, thanks to the generosity of Flury's Anglo-Indian maitre d' . Not only does he make a shopping trip at the crack of dawn to Entally market to buy these, but his wife cooks them n traditional style, marinated in vinegar and mustard oil. Only in India is the hospitality as warm as its sunshine! Straying down the by-ways of the past can be both heart warming and unsettling. Some of my happiest years were spent in the Pratt Memorial Girls High School on Lower Circular Road. I step through the gate to the Pratt and find myself zapped into a time warp. The L-shaped cream-coloured building, with its green wooden window shutters, the lawn, hedges and flowerpots are all frozen as though in a snapshot taken forty-five years ago. But appearances, like memories, can be deceptive. The Pratt, a day school in my time, is now a boarding school, and walking through the corridors I realise that time has wrought many subtle—and not-so-subtle—changes. My classroom on the first floor, however, is unaltered. The ghost of my thirteen-year-old self sits beside me at a desk as I pause for a moment bemused by the familiar smell of chalk-dust and the wedge of afternoon sunlight that still creeps across the wall near the blackboard.